Watermelon is definitely my favorite fruit. It’s thirst quenching in ways that boggle the mind. I remember @yaypie once pointing out that it’s because of electrolytes, which makes total sense! A close second is a good old fashioned apple. Can’t beat that crisp crunch and classic sweetness that’s not TOO sweet. Tomatoes are also in the conversation although they for sure occupy a more savory headspace I think. I probably eat more tomatoes than any other fruit just because I use them in cooking so often. Wait, WHAT?! I have never heard of these and I thought I had heard of every fruit there is. Chris if you are ever in Australia or South East Asia(SEA) try them, I've bougt a few in other places and been disapointed with the quality. If a grower in Hawaii or California can produce them and treat them for fruit fly, and retain the taste you get in SEA they will become very wealthy. In places like Hong Kong or parts of the middle east prices can be crazy!!!! the season is April to late August in SEA. There is another called Duku or Langsat which is bitter sweet which I believe is now also being grown in Hawaii, worth a try. That's so interesting because all the dragonfruit I've had here in NYC is stunningly gorgeous but doesn't have much flavor. What does it taste like? Have you ever heard of the Cherimoya? Mark Twain called them "the most delicious fruit known to men." I have tried the Cherimoya (Custard apple) I'm not a fan. which by the way convert nicely into a plum brandy hahahaha. oh, I love fresh figs! The plums look to me like prune plums. They are a favorite of mine too. They seem to be available (here in the northeast) when apples start coming off of the trees. Sometimes I see them at local farmstands / orchards and sometimes I can pick them up at Whole Foods. When the season comes, I will start looking more, and try different stores and markets. The ones I recall, were exactly like pictured above, but what set them apart was a very distinct and pleasant aroma, as well as their taste and sweetness. The lack of which, maybe just for me, but seems to be a problem with most fruit and legumes mass produced & commercialized these days.. Totally ok. The unripe cherimoya I've tried only once in the past was violently pine in flavor - very much like how I'd imagine tasting Pine-Sol would be! On a different note, I had the opportunity to try fresh Passion Fruit recently, and I can't recommend it enough. Its hard, leathery exterior belies a delicious syrup-y middle! Apparently you can even get passion fruit shipped to you on Amazon. Wow- no one has challenged the location of the tomato on that chart? No doubt, the plastic, fake orange things the stores call tomatoes these winter days, belong down there. But - in the summertime there are fairly good store bought tomatoes, locally grown tomatoes, and if you're diligent, your own REALLY GOOD home grown tomatoes. And for my money, really good home grown tomatoes belong at the summit of the chart! That's just not fair. I call some form of inequity here. Every year we try and grow tomatoes because WE LOVE THEM!! But no. They don't love us back. 😢 We must have a problem with our soil? The vines hardly grow when we put them in the garden, despite all the other garden veggies thriving. However, cuties!! We love the Mandarin oranges, they're like candy, and here's a pic of ours from a few minutes ago. They partially make up for our tomato fail. One summer, I grew a single tomato plant that grew to 7 feet tall and 7 feet across. There were over a dozen vines from that one plant and we usually harvested twenty or more tomatoes a week during July and August. I replicated the results the following year but I haven’t been gardening for several years now. Beautiful yard, great photo. We have hauled a ton of horse manure from the local stables and it seems to work for everything but the tomatoes. Oh well, we use potting soil and plant them in pots and they do okay. Gonna buy more pots this year to cure the tomato envy you've given us. Once you get them to thrive, hopefully there aren't many squirrels around your garden. When I had my tomatoes and cucumbers lot, I learned quickly to shield everything with mesh and fence, else these funny predators made fun of me, running away with my tomatoes, right there in front of my eyes! Birds helped too.. 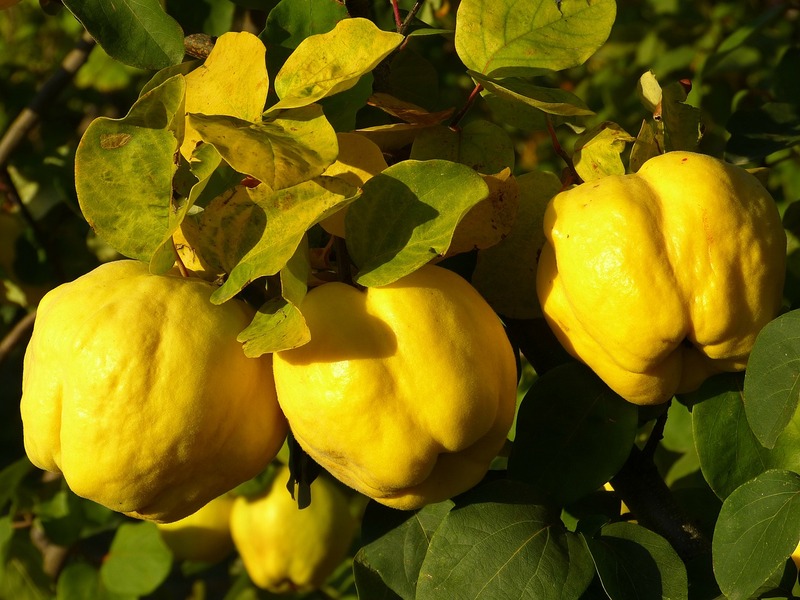 I often wonder about Quince. What efforts, sinking your teeth into these hard, very particular tasting fruits! Grandmother used to make an awesome, slightly sweet - pungent delicious oven baked meal from them, I'd like to try and recreate one day..
Quince paste with cheese and biscuits is one of lifes treats. Before I grew my 7 foot tall Little Shop of Horrors tomato plant, I spoke to an expert gardener friend because my previous attempts at growing tomatoes had always resulted in no tomatoes or a bunch of scrawny ones that weren’t worth all the effort. There were a bunch of things I did to improve my chances, such as building a raised bed, planting pollinator attractors like flox to get the bees around more often, using castings from the previous summer for my fertilizer. But the key thing that the gardener explained to me that made the biggest difference, I think, is that tomato plant roots need a lot of room. The taller and wider the plant, the deeper and wider the root system required. I had at least a 5 foot radius of unplanted soil around the center of my tomato plant. It was a big gardening gamble, considering everything else I could’ve grown in that plot, but her advice paid off. Grow a giant tomato monster this summer! They are all so good and healthy, however I would like to mention a point I think we should have in mind: it is better to consume fruits (and any other product) which has been grown as near as possible to our home. The transport of tropical fruits from far countries needs a lot of energy (fossil) and therefore pollutes our environment. Besides, the control of pesticides in developing countries is often not satisfactory at all (to express it kindly), the fruits and vegetables arrive clean at our country (tests have been undertaken) but the workers of the plantations of origin are frequently exposed to the chemicals without any protection and have also no possibility to chage their working conditions. Some may object that a reduction of the consumption of fruits from tropical distant countries could have a negative effect, the loss of jobs, for the native workers but if we manage to get rid of this dependency from eating any fruit year round our governments would be able to exercise some pressure on the responsible law makers of the producing countries. We have gotten used to eat all year round any type of fruit and have forgotten to consume acording to the season of the year which allows to get the best quality because of natural ripening with the consequent improvement in flavour and taste. Besides, it should be our aim and effort to support our local farmers, first of all those who are struggling to produce sustainable, pesticide and transgenic free products which is a nearly impossible task for them without our collaboration.